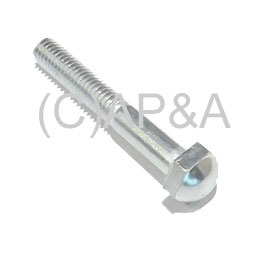 New metal leg bolt with chrome finish and acorn style head. 2-1/2 inch thread length (2-13/16 inch total overall length). Standard bolt for use with most makes/models of games (will not work on older mechanical games with wood legs). One game uses 8 (eight) bolts. Get rid of those ugly rusted or stripped leg bolts and make your game look new again with these bright new replacements! Sold individually. Replaces Data East/Sega/Stern # 231-5001-01, Bally/Williams # 4322-01125-38 and 4322-01125-44, Gottlieb # A-3775, and similar.